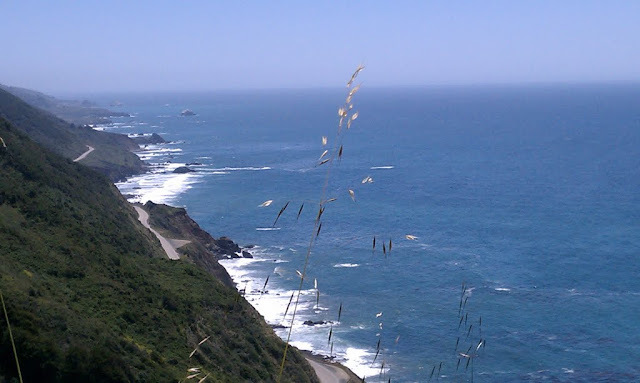 I've been wanting to ride the Pacific Coast Highway for several years. I decided in early December to try it if I could see a window of opportunity for good weather. I left home on 12/20 and rode four days out to the old NAS Moffett Field in Mountain View, CA at the south end of San Francisco Bay. Spent a couple days riding around SF, crossed the Golden Gate and Oakland Bay Bridges, ate fresh seafood at Fisherman's Wharf. Rode south on the Pacific Coast Highway to Port Hueneme then on to San Diego to spend 2 1/2 days. My wife drove out in her car to join me in SD. We wandered around San Diego visiting old familiar places and enjoying seafood along the waterfront. Most days the weather was excellent with beautiful sunny days but a little cool. Parts of the PCH are typical boring CA freeway but perhaps 100 to 150 miles of it south of Santa Cruz run right along the coast on a high ridge overlooking the beautiful blue Pacific Ocean. The cliff is probably 300' above the ocean in some locations. The ride is twisty and up and down enough to be a little challenging and the view is spectacular. I enjoyed the PCH more than I actually expected to. In San Diego we became aware that the weather back in west Texas was turning very bad so left early on Tuesday 12/30 to ride to Willcox, AZ with my wife following in her car. Next morning we left eastbound with a fierce wind out of the east and reports of ice and snow on the mountain passes at Cloudcroft, NM, Ruidosa, NM, and Guadalupe Peak in Texas. Rode only as far as Lordsburg, NM. Wind was about 45 mph and gusting to 55 mph. I was struggling to keep the wing on the highway. Too dangerous. I pulled into Smith Ford, a small town Ford dealer in Lordsburg and asked if I could park the Goldwing inside for a few days until weather improved and I could return to pick it up. The owner was a nice guy and gave me the okay. We continued east in my wife's car. I decided to travel east out of El Paso on I-10 and I-20 to Pecos, TX to spend the night then to Odessa, TX and turn north for home. That turned out to be the location of a heavy freeze and ice storm. The highway was black ice from Van Horn to Odessa and beyond and north as far as Seminole, TX. My wife's car is a Honda Pilot with computer-controlled 4wd so it's pretty surefooted on ice. We were able to keep moving at around 40 mph while the big trucks jackknifed, slid into each other, and slid off the road into the ditches and median. The highway was littered with crashed or stranded 18 wheelers and lots of cars/suvs/light trucks. We saw an overturned suv just west of Odessa with a man standing in the median weeping over a body covered by a blanket. Ambulance and fire rescue truck were on the way. TXDOT warnings urged citizens to stay off the highways but we continued on. My wife had to be back at work on Monday morning so we couldn't hang around in a motel until the ice melted. We made it home safely without mishap. I watched the weather closely and decided the most practical way to return to Lordsburg to get my wing home was to ride a bus. Not the most comfortable or fastest way but practical. On Sunday 1/4 I climbed aboard a a Greyhound in Lubbock and rode to Lordsburg arriving about 11pm NM time. I spent the night in an old dump motel next to the Ford dealer. Retrieved my Goldwing the next morning and rode it home. I throughly enjoyed visiting San Francisco again as well as San Diego and strongly recommend the Pacific Coast Highway to anyone who has not ridden it. It's a "bucket list" ride that everyone should take at least once. Very cool-you lived the dream. Nice writeup, and I'm glad you were smart enough to park the Wing when it got bad. Harvey, if you ever want to ride the Northern California coastline, let me know. I would be happy to meet you someplace, and show you the beauty of Northern Calif., with the Redwoods, the trees you can ride thru, and a LOT less traffic than you experienced in So. Cal. Thank you for the offer. I would enjoy that opportunity very much. I really wanted to start west of Portland, OR and ride all the way south but that would be a foolish goal during winter months. I had to settle for San Francisco south. Maybe this summer? What time of year do you consider the best time to ride northern California? Harvey, I think June would be a great time to do that ride. PCH is one of those roads that changes and delights every time. I've probably ridden it between LA and SF a dozen times and travelled South to LA from Port Angeles, WA after ferrying over from Victory BC. Glad you were able to experience and share with us. Makes me want to head over to the coast. The PCH is on my bucket list too. Coming from FL , I'll have to accrue some real time off for that one, since I'm not retired yet. "only governments can take a useful commodity like paper, and make it totally worthless by printing on it"
Thanks for the write-up. I'm heading out that way in July and the information on the more scenic sections of the PCH is very useful. This link http://www.pacific-coast-highway-travel.com/ has a lot more information than I could ever offer if you have time to browse it. The volume of information is overwhelming but it's a very useful site. Glad everything worked out for you. A beautiful and interesting ride. For the people coming from the east to northern California, if you can ride CA-36 from Redding west to Fortuna, you won't be disappointed. We did the ride up in late June. It was chilly with a lot of light rain. Plan for all seasons and enjoy the ride! I will traveling north to south, so I plan to ride a bit of CA-36 from Fortuna...don't know if I'll make it all the way to Redding (time constraints), but thanks for the tip. Thanks for the information. I understand the bay area can get pretty cool with the fog. I think it was Mark Twain who said (paraphrasing most likely) "The coldest Winter I've seen was a Summer in San Francisco".